Scientists outfitted praying mantises with 3D glasses made of beeswax to confirm that the insects have 3D vision. But they couldn’t show the mantises the equivalent of IMAX films. A group of scientists at Newcastle University just published their findings on mantis vision in Scientific Results and shared some hilarious images of spectacled bugs with the world. The study is especially interesting, since no one has really tested the 3D, or stereoscopic, vision of invertebrates before. Back in the 1980s, researchers put prisms of different powers in front of each of the eyes of a praying mantis. This induced it to make “systematic errors”—like always striking too shallowly to hit a target, or always striking to the right of a target—which indicated that they saw the world the way we did. It was not however, a direct test. The Newcastle scientists first tried to get the mantis to use the current form of 3D glasses. Each lens is designed to either block out or let through a certain type of circularly polarized light. One lens filters out light if the wave seems to be moving in a counterclockwise circle and lets through clockwise light, while the other lens does the opposite. This allows two different images to be broadcast simultaneously with only one image going to each eye. It works for humans. It did not work for mantises. When the scientists investigated why this should be, they came across a paper entitled, “Analysis of angular dependence of 3-D technology using polarized eyeglasses.” From that, they learned that in order to get each picture in each lens, the images have to be coming from directly in front of the person wearing the glasses. Turn too much and you get “crosstalk,” one signal getting in the way of another signal. So to get the mantis to see in 3D, the researchers had to go back to “anaglyph” lenses—the red and blue lenses we get with 3D comics—and sometimes see in older movie theaters. 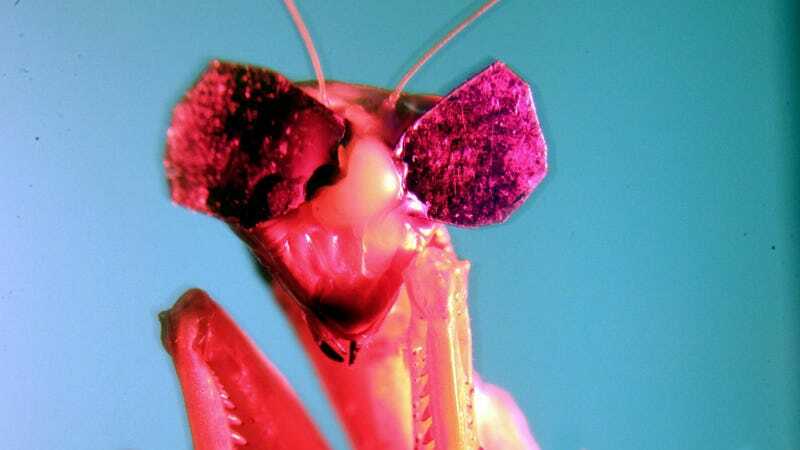 Mantises can’t see red light very well, so the scientists used green and blue lenses instead of red and blue lenses. This solved the crosstalk problem. Then, the Newcastle team put the mantises on platforms and showed them an image of a dark prey-like object on a bright background, while ensuring the screen was well away out of their strike range. When the image was 2D, the prey was clearly too far away from the mantis, and it didn’t strike. When the image switched to 3D, the mantises struck, because the prey appeared to “come off the screen” and hover within their reach. The researchers will continue to study insect depth perception, and hope that it will lead them to a better understanding of how humans got depth perception. And finally, here’s the full picture of a praying mantis wearing 1950s style 3D glasses, just because.